Below is a listing of job openings at UW-Extension. If you have questions, please contact us! The University of Wisconsin-Madison division of Extension seeks and innovative and community-focused, asset-based educator for the position of Human Development and Relationships Extension Educator within the Human Development and Relationships (HDR) Institute. The Human Development and Relationships Extension Educator will serve the people within their geographic areas by developing and implementing programming, educational opportunities, and fostering partnerships and action, and facilitating positive impacts that support thriving individuals and families, effective organizations, healthy and vibrant communities and strong economies. This position will provide leadership and teaching UW Extension education curriculum that strengthens families with a focus on prenatal to five parents and care givers. And, engaging in education programming that will build a solid foundation of human development and relationships skills that reach across the life span. The Human Development and Relationships Extension Educator designs, delivers and evaluates research-based educational programming and services aligned with the position's programmatic focus, examples which could include the following programming topics: mindfulness, supporting family relationships, families & technology, money management, children's literacy, and more. The Data Services Specialist supports qualitative research and evaluation at Extension. In collaboration with the Data Specialist/Data Governance Council Leader and other colleagues, the Data Services Specialist will plan and co-facilitate capacity building efforts around qualitative methods and qualitative analysis with colleagues across the state (e.g. county-based educators, specialists, evaluators). The Data Services Specialist will collaborate with the Data Specialist/Data Governance Council Leader and other Extension colleagues in analyzing state-wide collected data (for example through our central data collection system) and in producing regular reports on these data. The Data Services Specialist will also collect and analyze qualitative data associated with high priority Extension research and evaluation projects. Requests for qualitative support will come through an intake process that will be managed by the Data Services Specialist. The Data Services Specialist also supports the data governance structure at Extension. The Data Services Specialist and stewards the help email of our central data collection system, answers questions regarding our central data collection, and triages questions as needed. In addition, the Data Services Specialist assists in providing training and workshops regarding data input and use into our central collection system; reviews, tests, and improves help material designed by the Data Governance leadership teams; and provides data from the central data collection systems and related state-wide projects to internal stakeholders. The University of Wisconsin- Madison division of Extension seeks an innovative and community- focused, asset-based leader for the position of Family Engagement and Relationships Outreach Program Manager within the Human Development and Relationships (HDR) Institute. The Human Development and Relationships Institute facilitates and develops research-based educational processes and programs in Wisconsin for individuals, families, and communities. The Outreach Program Manager will be responsible for supporting the programmatic, professional development, and budget management needs of nationally recognized, innovative and creative county educators distributed among 72 counties within the state of Wisconsin. Primary programmatic areas will include education, research, and collaborative initiatives that are aligned with fatherhood, family strengthening, relationship building, parenting, co-parenting, cognitive development of children of incarcerated parents, kinship care, and caregivers of aging family members. The Family Engagement and Relationships Outreach Program Manager will report directly to the Human Development and Relationships Institute Director for management and supervision, hiring and employment authority, employment changes, compensation and benefits, supplies and expense budget, development of their state plan of work, and performance reviews. Upham Woods is a residential environmental education center in Wisconsin Dells. Its 318.7 acres of Wisconsin River Corridor, 14 buildings, and four program shelters provide the space to feed and lodge up to 202 persons per night. This facility serves over 11,000 youth and adults annually. It is located approximately one hour north of Madison, in Juneau County. Buildings include six cabins; a lodge that hosts the dining hall, meeting spaces, and a commercial kitchen; a two-story dormitory that has a 54 person bed capacity; a nature center that houses program animals, a wet lab, and three classrooms; a bath house; a welcome center/administration building; an arts and crafts building; a seasonal staff duplex that has six bedrooms, four full baths, two kitchens, and common space; and a two-bay, two-story maintenance shop. Eight miles of trails and paths provide access throughout the property. The property receives limited ongoing support from UW Physical Plant, and most skilled trade projects are completed by local contractors. Routine maintenance and custodial tasks are performed by the incumbent and a team of part-time staff. All work must be planned so as not to interfere with ongoing educational programs. The Wisconsin 4-H Program Manager provides educational and programmatic leadership for Wisconsin 4-H. Wisconsin 4-H is an Extension Program providing youth membership experiences for over 30,000 youth across Wisconsin. Wisconsin 4-H is one of two Extension Programs of the Institute for Positive Youth Development and is located within the UW-Madison Division of Extension Department of Youth, Families, and Communities. The Wisconsin 4-H Program Manager reports directly to the Positive Youth Development Institute Director for management and supervision, hiring and employment authority, employment changes, compensation and benefits, supplies and expense budget, development of a plan of work, and performance reviews. The Wisconsin 4-H Program Manager supervises a team of 4-H state staff members and Assistant Program Managers working to support county and tribal-based colleagues in delivering local and statewide educational programs for youth and volunteers. The Livestock Outreach Program Manager works with faculty, staff, and partners to develop needed livestock activities and manages the Livestock Extension Program. The Livestock Extension Program is one of several programs within the UW-Extension, Cooperative Extension Department of Agriculture and Natural Resources, Agriculture Institute. This position manages and supports outreach programs related to livestock, excluding dairy cattle, which are addressed through the Dairy Extension Program; this position will focus on beef cattle, swine, goats, sheep, etc. Relevant subject matter could include nutrition, bio-security and health, quality assurance, selection and reproduction management, facilities and facilities management, materials handling, manure management, odor control and air quality management, safety, economics and marketing. This 4-H Program Coordinator position will primarily serve Ozaukee County with an office location at 121 W. Main St. Port Washington, WI. Cultivating collaborative efforts and partnership with other organizations that expand 4-H programming opportunities. This individual will apply University of Wisconsin's research, education and outreach resources to address locally identified needs and opportunities. This position is primarily responsible for overseeing the Reserve's Research Program; coordinating and conducting high caliber research, implementing the Reserve's research strategy and meeting the goals and objectives on priority coastal issues detailed in the Reserve's five-year management plan. The specific priority coastal issues identified for the next five years are 1) climate change, 2) water quality and healthy coastal ecosystems and 3) resilient communities and strengthened sense of place. The Research Coordinator supports local research needs as they arise and ensures that the Research Program aligns with the national research strategy for the Reserve System. The Research Coordinator works closely with the Monitoring Coordinator to support the System Wide Monitoring Program, Sentinel Site program, and additional long-term data collection efforts. The position integrates with and supports the Reserve's other core sectors: Coastal Training, Stewardship, and Education. This position increases public awareness of the Lake Superior Reserve, Extension, and UW-Madison, plus related programs and builds support for these programs among the public, legislators, beneficiaries, and constituents. The Research Coordinator conducts and fosters high quality applied estuarine and coastal system research focused on the St. Louis River estuary and western Lake Superior watersheds. High quality research in this context includes the effects of environmental change on human and community resilience as well as ecosystem health. The position works independently, with co-workers, and with external investigators to acquire data and information required for completion of studies and programs of interest to the Reserve, the NERR System, and to regional communities. This 100% FTE position will serve as the administrative leader across Adams, Green Lake, Juneau, Marquette and Waushara Counties which comprise Area 14. The Area Extension Director will require great cultural competency to work with diverse staff and clientele and have the political savvy required to work with rural counties and multiple municipalities within the county to identify and assess new opportunities in programming, funding, and staffing. The Area Extension Director (AED) provides leadership, direction, and support for UW-Madison Division of Extension educational programming by building high performing office teams of Extension educators and county support staff, and fosters an environment that is inclusive, trusting, respectful, and collegial. The AED is responsible for managing the resources for Extension by overseeing the Extension county budgets and budget allocations. Reporting to the Assistant Dean, the AED will work with county governments, tribal nations, municipalities, and partner organizations to ensure that the educational needs of local communities are met. The AED serves as the direct supervisor for programmatic Cooperative Extension staff, and provides leadership in staff development and partnerships. The AED ensures compliance with affirmative action, equal employment opportunity and civil rights laws, regulations and policies while carrying out the primary duties. 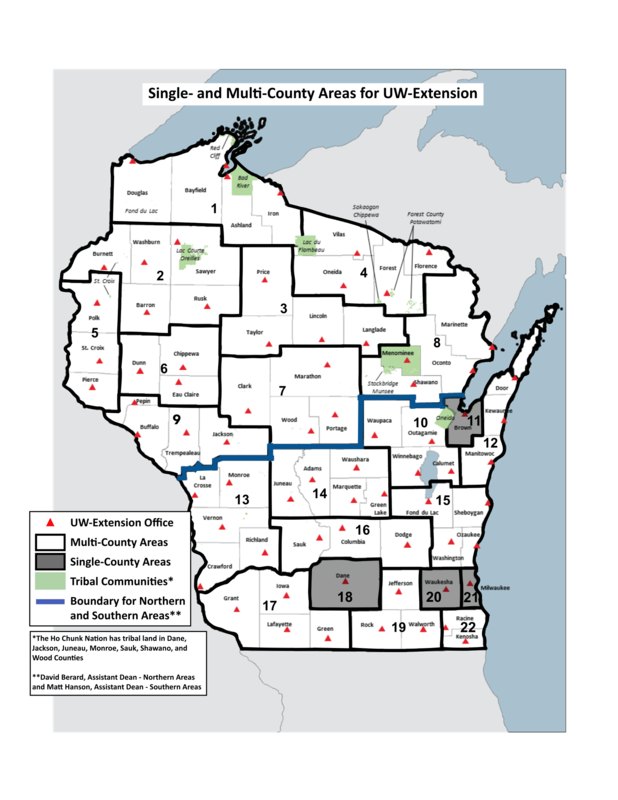 Please click here to view the Multi-Area Map of Wisconsin. The FoodWIse State Program Manager provides administrative leadership and oversight to program development, implementation, evaluation and reporting for the program. FoodWIse is a community-based nutrition program that seeks to empower individuals with limited incomes to make healthy choices to achieve healthy lives and reduce health disparities. FoodWIse is federally funded by the Supplemental Nutrition Assistance Program-Education (SNAP-Ed) and Expanded Food and Nutrition Program (EFNEP) grants.